If you are like me, you have a Good Seasons glass cruet bottle in your cupboard. You know the one. It has the V-W-O marks on it so you know how much vinegar, water and oil to mix with the seasoning packets. Did you know you can use the same concept to make your own dressings and the seasoning possiblities are endless! Inspired by a great article in the food section of my local paper, I will share with you the 3 basic steps to making your own dressings. Once you get confidence you may find that you don't even need to measure! Start with basic ingredients and add interesting flavors and herbs along the way! 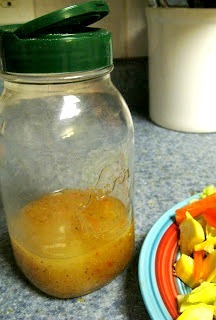 Even if you aren't a huge fan of Vinegar, I'll show you have to make a great dressing without it! Don't have a fancy cruet? Grab a canning jar and lid, it'll work just fine! Jan's Tip: Did you know that the green lids from the jars of grated parmesan cheese are a perfect fit on canning jars and make a perfect lid to pour from? Most vinaigrette's are made in a 3-1 ratio. That means you generally measure 3 parts of oil with 1 part vinegar, plus your flavor add-in's. You don't really need an exact measure on these, but can mix it to your own taste preference. So for example: 1/4 cup vinegar or juice with 3/4 -1 cup oil is a good starting point. Jan's tip: Taste as you go, and adjust your ingredients as you like. The foundation of any vinaigrette is the Vinegar. Don't have vinegar or not a huge fan of vinegar? Here's where your creativity really kicks in! Choose any combination of herbs, seasonings, and fruits that you like. How much to add in is up to you,but anywhere from 1/2 teaspoon for stronger flavors to several teaspoons of mild flavors is a starting point. (this goes for both the flavor and emulsifiers) Add them to the vinegar and gently shake to blend. Fruits: Chopped or pureed: such as raspberry, strawberry, orange, grapefruit. Jan's tip: ?? What is an Emulisifer and why do I need it? Emulsifiers help thicken your dressing so it coats your salad and doesn't just sink to the bottom of your plate in a puddle. You don't need it but a touch of it helps alot! Add in your oil, close lid and shake dressing to blend. (Yes you can make this in your blender or processor, but it's not nearly as fun and more to clean later!) Refrigerate any leftover dressing. Want a few recipes to get you jump started? Here you go! Jan's tip: All of these recipes would make a great chicken marinade also! Perfect before grilling! Blend all ingredients together, Makes approx. 1 cup dressing. Store in refrigerator. This dressing does not follow the traditional 3-1 ratio of oil to vinegar. It's a very light dressing! 2 small handfuls of fresh cilantro, finely chopped. Mix all ingredients together and refrigerate. Makes approx. 3 cups.